I had a dream in which I was at my old home in the Dominican Republic. The house was being burglarized and we were on the second floor of the house. We were all sweating from the intense heat. I was in a small bedroom of my house with all of my siblings. I am the eldest, and the youngest of my siblings are 12-year-old twins. Anyway, we were all there and I saw my husband running towards me telling me to take all the children into the bedroom and lock the door. As I was running and escorting all of my siblings into the bedroom, I noticed that a glass door ,which led to a balcony, was opened. I was terrified, since I knew that the burglars were in the house. I knew that we may get hurt in the process of trying to hide from these burglars. I woke up extremely scared and with sense of loss. I felt as if I had been robbed in real life. This is the same feeling I felt today as I was watching the film Elizabeth: The Golden Age (2007). 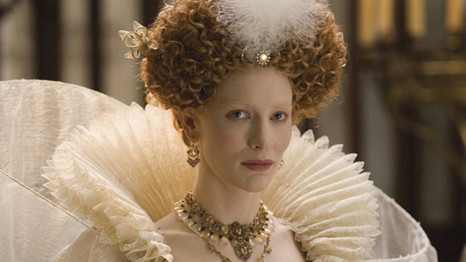 The beautiful costumes that Cate Blanchett wore were stunning. The gowns were magical in every sense. I loved the colors of the gowns, the fabrics, the jewelry and the feathers. I suddenly thought…..what happened to the days where people dressed up to go to parties? When it was glamorous to “really” get dressed up and wear beautiful pearls without feeling overdressed. The simple words: “Black Tie”, gave people excitement and all the ladies would go out and buy fabulous long gowns. I often attend family events, and even holiday parties, where people are fine with wearing jeans and a nice shirt. This seems to be the staple now a days. If one goes to a party or a wedding, a casual dress from Ann Taylor or Macys with some jewels is fine. A simple short party dress is fine for a formal reception. There are no more tailored suits with cufflinks and a nice tie. Whatever happened to wearing a nice jacket? I am not suggesting we go back to the Elizabethan era and wear corsets, but I long for the days where people got dressed up to have a good time. I remember when I was about two or three-years-old, and would travel to the U.S. with my grandfather, and he would always wear a hat similar to those of the 1920’s. He would also wear tailored pants and a nice shirt. People got dressed up even to fly and push their luggage. Now, the only thing I see at the airport are very poorly dressed people with no shoes or socks at the security line. I especially see poorly dressed people while pumping gas. A few days ago, I saw a gentleman in a luxury vehicle pumping gas with flip-flops, blue shorts, yellow shirt and a fanny pack!!! So, it is ok to be luxurious with our cars but not ourselves?